We've just posted some really wonderful boys on our China Waiting Children page. 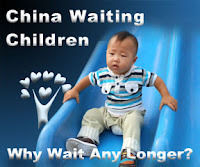 China Waiting Children can be adopted by single moms or married couples who have completed a qualifying homestudy. Click on the picture to see them all!